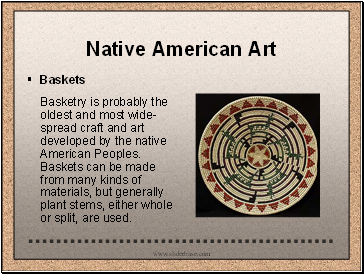 Basketry is probably the oldest and most wide-spread craft and art developed by the native American Peoples. 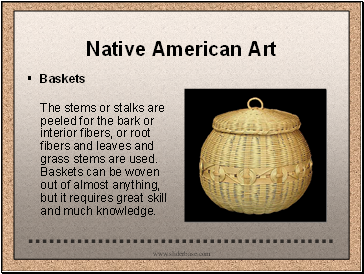 Baskets can be made from many kinds of materials, but generally plant stems, either whole or split, are used. The stems or stalks are peeled for the bark or interior fibers, or root fibers and leaves and grass stems are used. 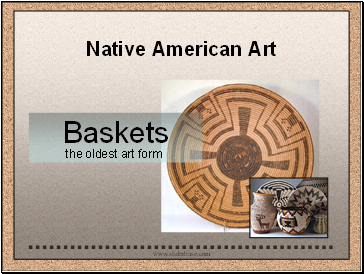 Baskets can be woven out of almost anything, but it requires great skill and much knowledge. 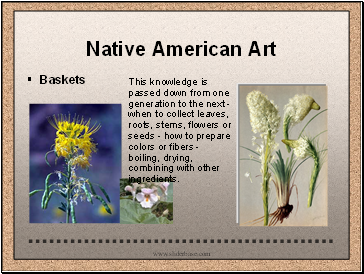 The roots, stems, bark, leaves and flowers of different plants produce the broad range of colors in most baskets. Identical plant materials gathered in different seasons may produce different colors. 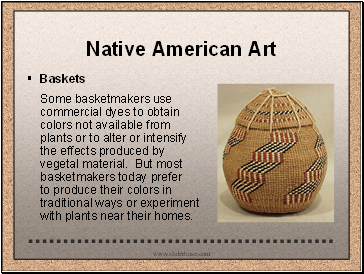 Some basketmakers use commercial dyes to obtain colors not available from plants or to alter or intensify the effects produced by vegetal material. 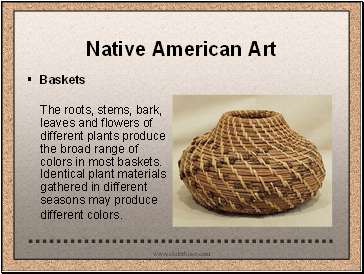 But most basketmakers today prefer to produce their colors in traditional ways or experiment with plants near their homes. 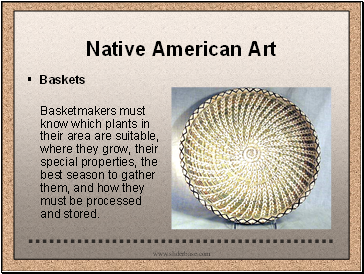 Basketmakers must know which plants in their area are suitable, where they grow, their special properties, the best season to gather them, and how they must be processed and stored. This knowledge is passed down from one generation to the next - when to collect leaves, roots, stems, flowers or seeds - how to prepare colors or fibers - boiling, drying, combining with other ingredients. This Papago Coiled Plaque was crafted by Thesesa Andrews Atohono O odham , the Desert People of Southern Arizona & Northern Sonora. 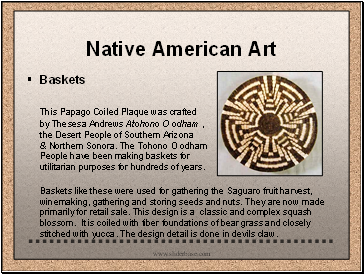 The Tohono O odham People have been making baskets for utilitarian purposes for hundreds of years. Baskets like these were used for gathering the Saguaro fruit harvest, winemaking, gathering and storing seeds and nuts. They are now made primarily for retail sale. This design is a classic and complex squash blossom. It is coiled with fiber foundations of bear grass and closely stitched with yucca. The design detail is done in devils claw.